But Stitch Fix sent me white pants. 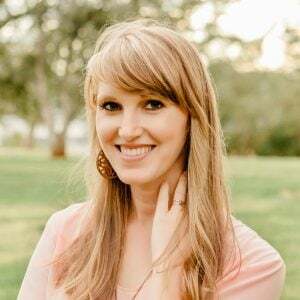 I use Stitch Fix because I finally decided to outsource my fashion choices. I’m always making poor ones, so why not get a stylist to do it? They came on a Saturday and we had friends over that evening for dinner. I wore them, tags still on, to get my friend’s opinion on whether or not I should keep them. And she said they were cute and it was a definite yes. Then I sat in guacamole. Literally 30 minutes in my foray in the realm of white pants, and I end up with a bright green stain. I hadn’t even taken the tags off yet. Everyone called me Guacamole Pants for the rest of the night, and I can’t even blame them. 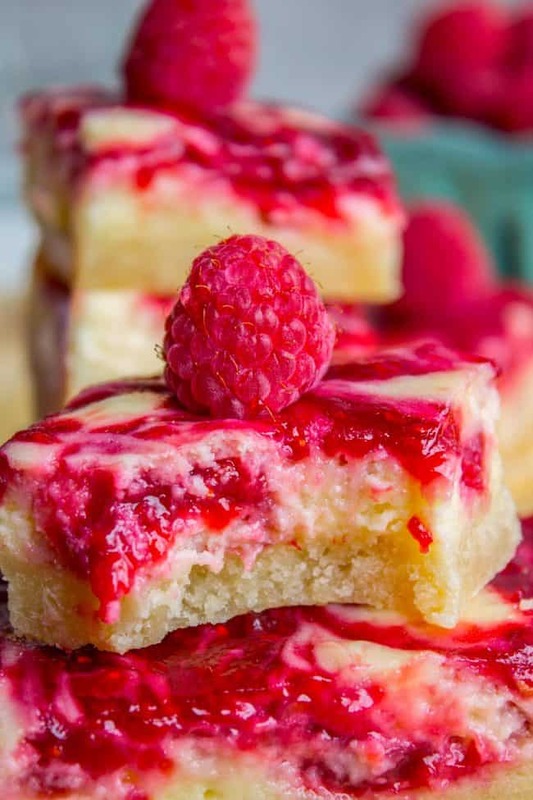 I highly recommend changing into something less white when you eat these Raspberry Cheesecake Bars. That berry juice is NOT washing out. 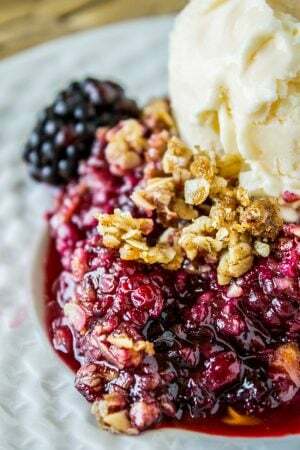 This would be great to make with the fresh raspberries that will be in stores soon! Or use frozen berries. Sometimes they taste even better than fresh ones because they are frozen immediately after being picked. That’s what I did! P.S. The guacamole washed out of the pants just fine with spray and wash. Now they will make a great addition to the museum section of my closet, unless you all pinky-swear to me to be the one to tell me next time I sit in guacamole. P.P.S. immediately after publishing this, I saw ads on my blog featuring a dude wearing white pants. No joke. Big Brother KNOWS, GUYS. 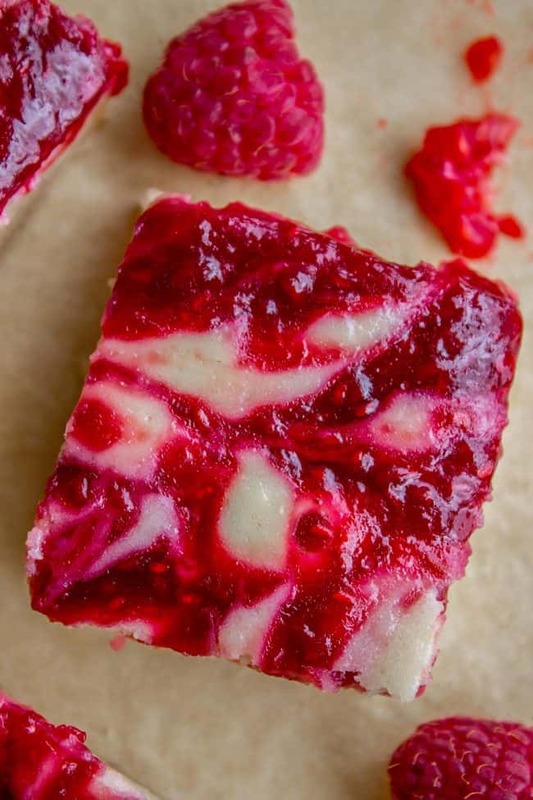 Make the raspberry swirl: In a small saucepan, combine 6 ounces raspberries, 1/4 cup water and 1/4 cup sugar. Bring to a boil over high heat, and boil for 3 minutes, stirring. Reduce the heat to medium and then cook, stirring occasionally, for another 5-8 minutes, until mixture is thick. (It will continue to thicken as it cools) Set aside to cool completely. I put mine in the fridge. Make the crust: In a large bowl or stand mixer, beat the 1/2 cup butter and 1/2 cup sugar until light and fluffy, stopping to scrape the bottom and sides. Add the salt and flour and combine. It should look like coarse crumbs. It won't come together in a ball, but if you squeeze a bit in your hand it should stick together. Pour the mixture into the prepared pan and press down. I like to use the bottom of a glass for this step. Bake at 350 for 16-18 minutes, until the edges are just starting to turn golden. Remove and set aside. Meanwhile, make the cheesecake filling. Beat the cream cheese until smooth, scraping the sides and bottom. Add 1/2 cup sugar and beat. Add the egg and almond extract, and beat well. When the crust has had a few minutes to cool, pour the cheesecake mixture in and spread to the sides. Dollop the raspberry mixture on top of the cheesecake. Make sure to leave some white parts visible so that you have a chance to swirl. Use a knife to make swirls back and forth across the pan. Cover and refrigerate until completely chilled, about 2 hours in the fridge, or one hour in the freezer. Use a sharp knife dipped in hot water to slice the cheesecake (if you want clean lines). I use a washcloth to wipe off the knife in between slices. If you prefer a taller cheesecake layer, double the cheesecake filling ingredients (cream cheese, sugar, egg, extract) and leave everything else the same. Bake the crust the same amount, but increase the bake time for the cheesecake to about 50 minutes. 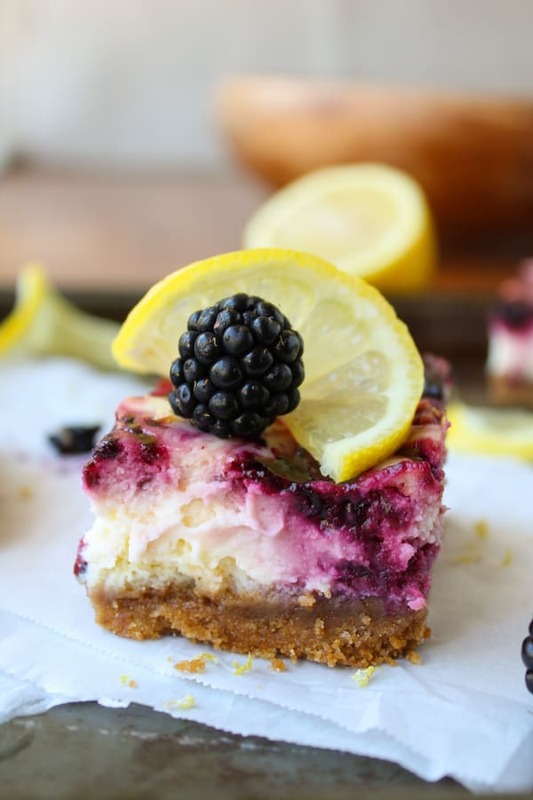 Blackberry Lemon Cheesecake Bars << these are sooo good. 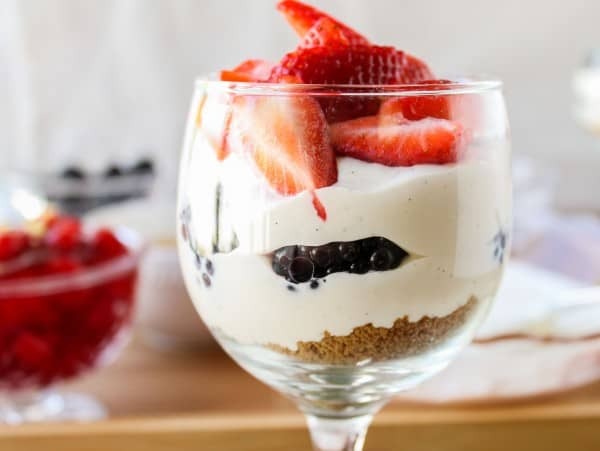 No-Bake Cheesecake Parfait Bar <<this recipe gives you all the benefits of cheesecake and none of the work. I LOVE it for parties and showers. 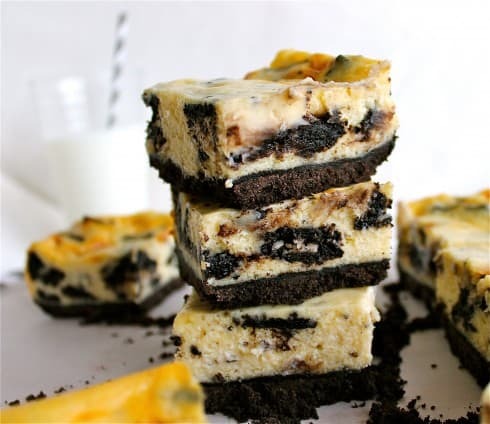 Oreo Cheesecake Bars (And I Had a Baby) <<for some reason the title on this always cracks me up. Click over to see baby Truman! 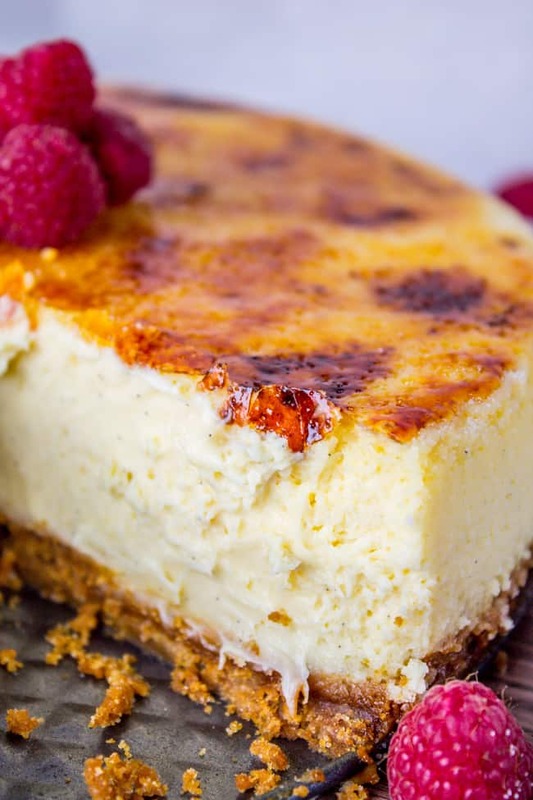 Crème Brûlée Cheesecake << this is one of the most-made recipes on my site. Many people have told me that it’s the best cheesecake they’ve ever had! 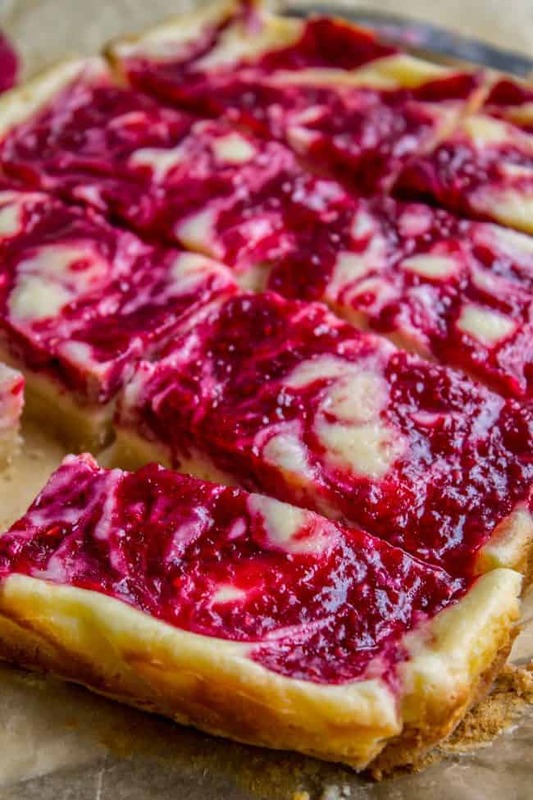 More raspberry cheesecake creations from blog friends! I just made these, they’re in the oven now! The Raspberry sauce was extremely seedy. Is the sauce supposed to be strained or did I just find a seedy bunch of berries? Either way, I did strain the seeds out, but just wondering if that was necessary and or reccomended. Hey Carrie! You can totally strain the seeds if you like, it’s just a personal preference! These bars are incredible! I made them last night to take to Thanksgiving today, and made a small side batch to taste – it’s half gone already! The recipe is also well within my work-to-deliciousness threshold (it’s actually less work than I thought it would be). I saw someone else had concerns about the almond extract because of nut allergies; I used imitation almond flavor for that reason and it was perfect. Almond isn’t a strong flavour here but I think it is crucial to this heavenly treat. 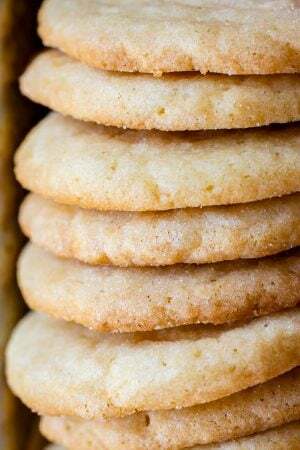 You are so smart to make an extra side batch for tasting! 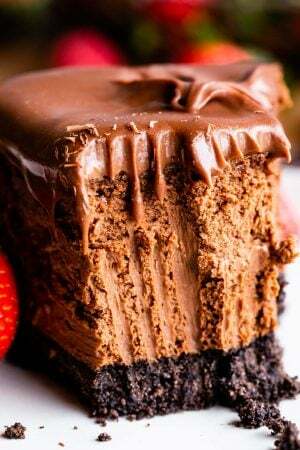 Cheesecake is one of those things that you are trying for the first time along with your guests, and it can be a little nerve wracking, haha! I’m totally doing this next time I make a new cheesecake recipe! I’m so glad you liked it, thanks for commenting! Aww, thanks! Because I was making a big batch, I doubled the crust and sauce and quadrupled the cheesecake for a 13×9 pan – they ended up with just the right proportions even after I took some of each for the little test pan (3×5, I think?). The only issue I had – which was entirely of my own doing – was that I packed the crust really, really hard which made it super difficult to cut through. Next time, because there will for sure be a next time, I’ll just use a softer hand for that part. 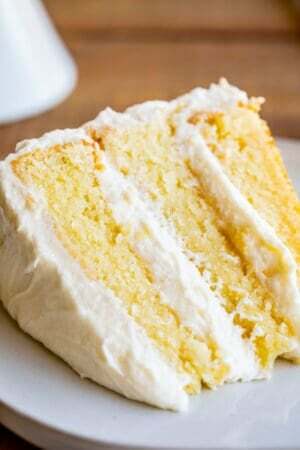 Thank you for such a stupendous recipe! Any adjustments needed if I want to use blueberries instead? Instead of an apron, I have specified shirts (previously stained) for the kitchen. Especially if I’m doing anything with frying. I can’t wait to try this recipe. Thank you! Hey Bru! I like your specified shirts idea! As far as blueberries, I just don’t know, I haven’t tried that. I can’t guarantee results but I have a hunch it would work out fine as is! OMG is this ever a fantastic treat! !We have a small raspberry patch.Always on the lookout for something new. The only thing I didn’t do was to use parchment paper. I let it cool in the fridge overnight. Ok,I admit it-I did try a small piece from the corner.Hard to stop with just one taste! It would be easier to cut had I used the paper as I could set the whole pan on the cutting board. Oh wow, I wish I had my own raspberry patch!! I would be making these every day :) I’m so glad you liked it! And yeah, I don’t always use the parchment paper, especially if we’re just eating it at home, but if I’m taking it out somewhere it does help with presentation. Thanks so much for coming back to comment Marilyn!! is there any substitute for eggs in the recipe? Hey surbhi! I’ve never made this without the egg. You could try using an egg substitute. I know people use flaxseed to replace eggs sometimes, but I’ve never tried it. Let me know if you make it! they both use a pretty minimal amount of flour. I have NOT tried it so can’t guarantee results, but I bet if you swapped in a cup-for-cup gluten free blend, either recipe would work out just fine. Let me know what you try out! 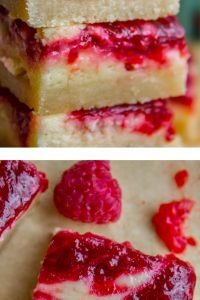 Can I replace the raspberries with Strawberries without changing anything else in the recipe? I hope you enjoy it as much as we did Tadej! Sounds so yummy. Can I use Strawberries instead of raspberries? Would that require any special changes in recipe? Hey Elaine! Yes I think using strawberries would change the recipe. Strawberries are a little more finicky when baking. 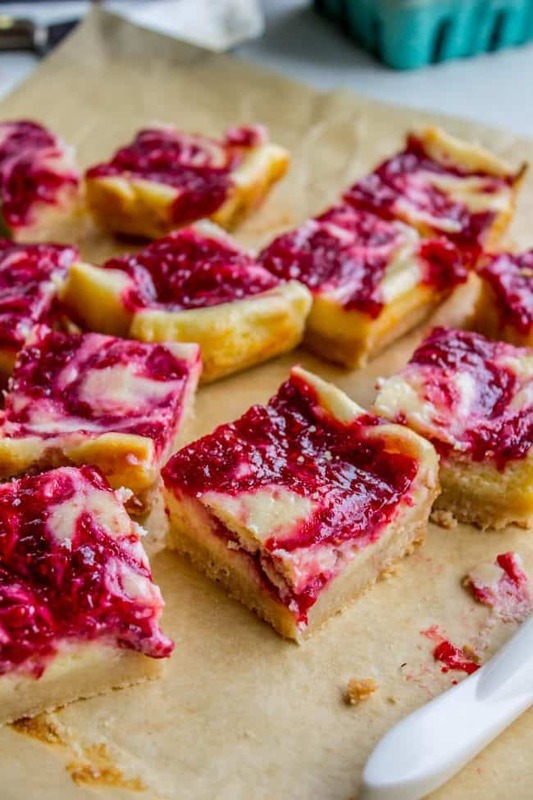 I would look up a recipe for strawberry cheesecake bars! What a hilarious story!!! Thanks for making my day brighter! I definitely can’t be trusted with white pants. Or white anything, really . . .
I’m making these for my Book Club. They will think I’m a Goddess! You are the BEST, Always making me look so good!! THANK YOU!!!!!!!!!! 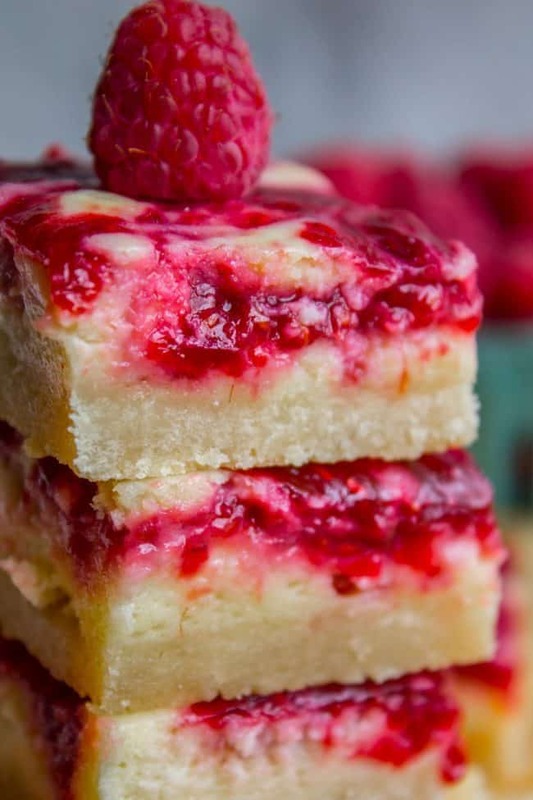 I agree, white pants are a very bad idea, but these raspberry cheesecake bars? Inspired! hahahahahhaha!!!!! You’re post cracked me up! All hail big brother!? 😂Also, these cheesecake bars are so delish! Need these in my life! And also, no white pants for me! I’m just as clumsy and they won’t last an hour on me hhaahaha! Hahaha! You’re right, I never wear white pants- disaster always awaits when I do! You taught me well, Mom. Clearly I’ve strayed too far from the marked path. So, you know how like color pants are all the rage too? So, for MY first foray outside of black or denim, I went with a really neutral pink. Turns out… my skin color is basically light pink. I have caught myself in the mirror and freaked out for JUST a split second that I wasn’t wearing pants. SUPER AWKWARD!! They’ve been up on the shelf all winter since they’re capris… not sure if I’ll be busting them out this year. I’m really hoping you have internal conversations like I do. Also, what does it say when my fashion goals are to have pants like my 6 and 3 year olds? Hahahaha!! I remember having the same realization years ago. Tan, pink, any of those “neutral” colors that look gorgeous on anyone tan or ethnic, just looks like we’re not wearing pants. So sad, hahaha!! Also just want it on the record that I have definitely gotten fashion ideas from my children before, usually clothes that other people bought them. Obviously. My son has a nut allergy so I’ll have to skip the almond extract. Can vanilla extract be substituted? Hey Mary! Yes vanilla will be the perfect substitute. The almond flavor it pretty subtle anyway. I’ve got to make these very soon! They look amazing! And I never wear white pants. I would stain them the first day for sure. Between my own natural clumsiness and having small children climbing on me, they’d have no chance. I’m in the same boat Laura! You are wiser than I. You just never know when some small child is going to squirt something on you! Just the other day I was trying to squeeze petroleum out of a tube for miss Valentine, and it wasn’t coming out so I was squeezing harder and harder and then I looked down and there was petroleum all over my pants, because the tube had leaked out the back. You can’t make this stuff up!!! haha! I made these and they were awesome! Except I think I pressed down the crust a bit too vigorously because it was almost too crunchy to bite. I’m going to double the recipe for a potluck this weekend and be more gentle! Also, this is an appropriate place for a whìte pants update, yes? Literally a few days after this post I bought white shorts!! They were on sale at Costco. Enough said. I figured I would just break out the stain stick every time I wore them, and I have, and so far they are still white. But now I also have the shorts issue. I thought, they’re just below knee length so I only have to shave up to my knees, right? And then I wore them to a parade and sat down on a blanket and realized that the shorts were now above my knees. And boy were they hairy knees. I had to sit with my arms crossed over my knees the whole time. Fun times. Hope you don’t mind my hairy knees story. We’ve shared the love of cheesecake bars so we’re now friends forever, lol. That story is hilarious Karen. It could only happen to you! Save those white pants and I’ll send you some outfit ideas. You’ll be okay I Promise. Just don’t wear them when you’re cooking . . . These bars look amazing. I think I’ll see if there are raspberries next time I go to the store. I’m not the only one Kris! Look I’ve got other moms backing me up here in the comments!! I’m not the only Guacamole Sitter out there!! ;) But yes please send me your outfit ideas because I can’t send them back now!! I’m the one who has grease spots on all my tee shirts from forgetting to wear an apron when I’m cooking, aarrrgggh! I do have a pair of white crop jeans that I love, but I am always rubbing up against the Jeep, which is usually covered in our last muddy adventure, and I have to remember to treat the jeans before I do my textile management ;) Good looking raspberry treats, one of my favorite fruits! Ah! Mary I’m the worst at wearing an apron! You would think I would learn! Adventures in your Jeep sounds fun. You sound outdoorsy and probably have a great tan, so people can actually tell when the pants start and your skin stops, unlike when I wear them. haha! ;) Work those white pants, girl. Hope you enjoy the cheesecake bars! !